This Flash tutorial will teach you how to create a horizontal navigation bar with a zoom effect on the menu items. When the user clicks on a menu items the text will zoom in, before displaying the navigational page. Some knowledge of basic buttons and opening urls will be needed for this tutorial. Open a new Flash document with an appropriate stage size. I have used a 400 width by 100 height stage size with a black background colour. Convert your rectangle into a symbol by selecting F8. Give your symbol the name “menu bar”, check movie clip, centre the registration point and click ok. Select the text tool (t) and type the name of your first menu item. I have used the Myriad Pro font type with white colour, but you can use whatever colour and font you wish. Convert your text message into a symbol by pressing F8. 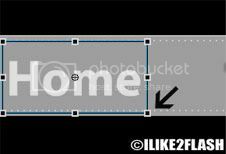 Give your symbol the name “item 1 button”, check button, centre the registration point and click ok.
Now convert button into symbol by pressing F8. Give your symbol the name “item 1 movie clip”, check movie clip, centre the registration point and click ok. I have also added a glow filter to the movie clip to give a black outline around the text. You can also add a knocked out text effect on the movie clip if you wish. You should now have button inside a movie clip which is inside a movie clip. Double click on your first movie clip (text message) to enter the movie clip’s timeline. Now insert a keyframe (F6) at frame 20 then return to the 10th frame and insert a keyframe (F6). On the 10th key frame, select the Free Transform Tool (Q) and hold down the shift key and drag one of the corner handles, so that the text is slightly larger. Now right click anywhere in between the 1st and 10th frame and select Motion tween then repeat this for the 10th and 20th frames. Select the 10th frame using the Selection Tool (V), then selects the text on the stage and change the colour properties to Alpha and at 0%. **For more information on getURL checkout the open url tutorial. The code above basically stops at the 20th frame and displays the web page. Test your movie clip Ctrl + enter. Use your mouse to click each button. You should now have a zoom horizontal navigation.Feel free to contact me for any questions or comments and remember to subscribe.